The story goes on that Jesus tells them He must be killed and rise again on the third day. There’s a line here that I love. “Peter took Him aside and began to rebuke Him.” Good old Peter, he’s my hero. He always manages to say and do the wrong things. Who the heck rebukes Jesus? Peter has just said that Jesus is the Christ, now he has the nerve to rebuke Him? He’s calling the Son of God a liar? Of course Peter pays for his foolishness, just like he always does. Jesus calls him Satan. “Get behind me!” He says. I imagine that Peter knew he’d made a mistake as soon as the words left his mouth. If he was Homer Simpson he would have said “Doh!” But it was too late. I think we can all relate. How often do we say things and right away we realize we’ve made a mistake. But once the words are out there, the damage has been done. On the other hand, Jesus tells him that he’s thinking like a man and not God. But, what did Jesus expect? Peter was a man. Jesus was God. It seems reasonable that Peter would think the way he did. If we look at Matthew’s Gospel we find the almost identical story with one difference. In Matthew’s telling of the story Jesus also calls Peter Satan. He also tells him that he’s thinking like a human being. Everything is almost exactly the same. Almost. Jesus acknowledges the fact that Peter has been blessed with knowledge that he couldn’t have gotten anywhere else. Isn’t the same thing true for us? We can read all the Scripture we want. We can listen to all the learned Christian speakers of this time and all the time before. But the idea that this man, this Jesus of Nazareth, is the Messiah, the Son of God, doesn’t make sense. It’s not logical. Nothing like this ever happened before or since. Peter’s understanding comes from faith, just like our understanding comes from faith. Week after week you and I come to church. We hear the readings and the homily. The message doesn’t change. Jesus was the Son of God. He performed miracles. He told us to love one another. But when it’s all said and done, there is no proof that He was who He said He was. We have to have faith. Like Peter, these truths are revealed to us by Jesus’ heavenly Father. The Holy Spirit, the Advocate that Jesus left us has to move within us or the Bible is just a nice story book written thousands of years ago. If that Spirit isn’t working within us, then we might as well be reading from the Book of Mother Goose. Sometimes you have to wonder why Jesus didn’t surround Himself with the best and the brightest. Why did He choose tax collectors and fishermen? Why did He pick the Apostle who seemed the least likely to be a leader to be the head of His Church? It’s simple. He did it to give hope to you and me. If these twelve guys could build a church that would grow into the millions of members, they had to have help. And while we aren’t called to judge anyone, we have to feel pretty good about our own chances when we look at the men Jesus chose. Through baptism and confirmation, we receive that same Holy Spirit. Every one of us is able to spread the Gospel just as well as Peter and the others did. That’s what we’re called to do every single day. All these saints that we venerate in this beautiful church did it, even though most of them were far from perfect Christians. They inspire us to do the same. So, when we read the Scriptures, when we look at all these men and women whom the Church has declared to be saints, we’re inspired by the words and deeds of these holy people. But we also realize that we have the same opportunity to share the Gospel as they did. And, when we realize that they had the same faults and failings that we do, we have the hope that we can do what they did. We can use the talents and gifts that God has given us and be examples of faith to others. When we’re tempted to remain silent, maybe afraid that we’re going to look foolish if we speak up, we need to remember that, even in the beginning of the Church, God chose flawed human beings to deliver His message to other flawed human beings. That’s His plan for humanity. You and I are just as much a part of that plan as Peter, or the other Apostles, or any of these saints. What an awesome God we have! And what an awesome opportunity we have to tell the world about Him through our words and our actions! BE NOT AFRAID! We sang those words just a few minutes ago. At least some of us did. Some of us just listened. Some of us are afraid to sing. It’s kind of ironic that we might be afraid to sing “be not afraid”. I guess it’s just part of being human. In spite of the song, sometimes fear is a good thing. If you’re afraid of heights, you might avoid a dangerous situation. If you never stand on the edge of a cliff, you’re never going to fall off. If you’re afraid of snakes, you might avoid getting bitten. They say that most people are more afraid of doing what I’m doing now—speaking to a crowd, than they are of dying. I can relate. You notice that I never let go of this ambo. I never separate myself from my notes. If you start to throw things, I can duck down behind this thing. Yes, you are an intimidating bunch. It’s a little scary to be up here. In today’s Gospel, Mark tells us the story of Jesus sending the Apostles to spread the Good News. Basically He sends them out empty handed. All they can take is a walking stick and sandals. They couldn’t take food or money. They would have to depend on strangers for their meals and their shelter. At least they didn’t have to go out alone. He sent them in pairs. Still, it must have been scary for them. Put yourself in their place. Ever since they met Jesus they’ve been like rock stars; or at least like roadies. They’ve traveled with the Master. They’ve basked in the reflected glory of the Son of God. Now, all of a sudden, they’re on they’re own. They’re going to preach what Jesus has taught them. He did give them power over unclean spirits and to heal the sick. But still, it had to be easier to be with Jesus than to go out and claim they had Jesus’ authority. They did drive out demons and they did cure the sick. But it had to be very hard to approach that first town. Obviously, Jesus knew that they wouldn’t necessarily be welcomed with open arms. Remember, He told them that if a place didn’t welcome them and listen to them, they should leave and shake the dust off their sandals in testimony against them. The only easy thing Jesus told them was when they entered a house they should “stay there until you leave”. I think we could all handle that. See, the Apostles knew the scriptures, which at that time meant the Old Testament. They were familiar with our first reading today from the prophet Amos. Amos was prophesying in Bethel. Amaziah, a local priest told him to get lost. “Go preach in Judah!” he said. “Leave here and don’t come back!” Amos answered that he had been sent by the Lord to prophesy to His people, Israel. But he did have to leave Bethel. Amos had been a shepherd but the Lord sent him to Bethel, just like Jesus sent the Apostles. That story had to be in the Apostles’ minds as they headed out on their mission. This was scary stuff. But the Apostles had something that Amos didn’t have. They had each other; they had strength in numbers. Even today, some of our protestant brothers and sisters, particularly the Mormons and the Jehovah’s Witnesses who are known for their door-to-door ministry, travel in pairs. We Catholics aren’t so good at that type of evangelization, but when we do it, we do it in teams. It’s much safer that way. This Christian faith of ours is all about relationships; our relationship with God and our relationship with one another. If you read the Genesis account of the creation of Adam and Eve, God saw that everything He’d created was good; except Adam. He realized right away that Adam needed a companion and so He created Eve. Some very holy people are comfortable living as hermits but most of us need companionship. The noblest thing we can do as human beings is to help one another get to heaven. That’s why we meet once a week in this church, to listen to the Word of God and to share a meal-a very special meal-the Body and Blood of our Savior, Jesus Christ. At one time hundreds of Catholics gathered in this house of God to do just that. But times change. Demographics change. People move away. Today we can measure our attendance in dozens rather than hundreds. Our call is to help one another to gain eternal life. We’re called to bring new people to Christ; either people who don’t know Him, or people who have forgotten about Him. Like the Apostles in today’s Gospel, we’re Jesus’ mission team. Because of our location, our ethnicity, and our historic church, we get a lot of visitors. Are there any visitors here today? If any of you regulars see an unfamiliar face, please take a minute and say “hello”. Make them feel welcome. Make them want to come back. The last thing we want is for them to leave, knock the dust off their sandals, and never return. Archbishop Carlson has asked us to be “welcoming, hospitable, and committed to sharing the Good News of Jesus Christ with others.” That’s what Amos the prophet did. That’s what the Apostles did. That’s what Jesus did. Should we do any less? 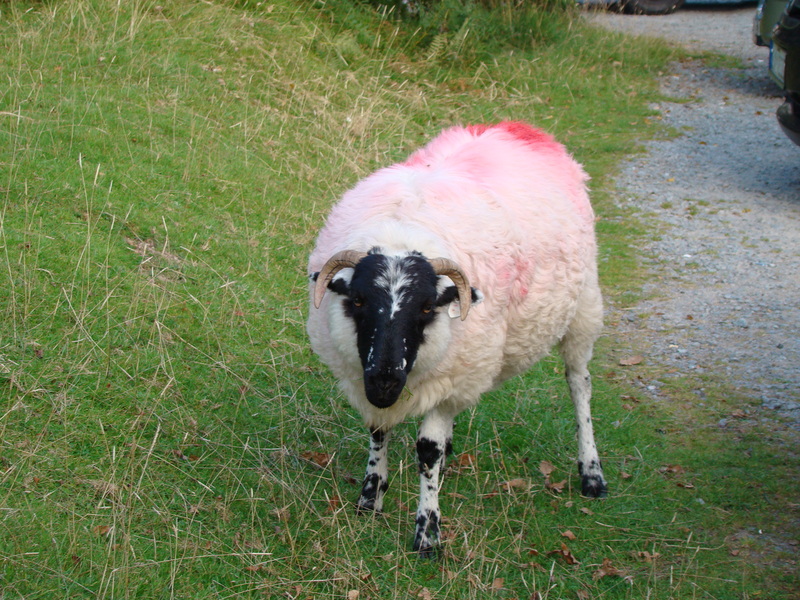 Actual Irish sheep taken by yours truly in 2008. It’s been my experience that when people discuss a controversial issue concerning the Catholic Church, sooner or later, someone in opposition to the Church will argue that Catholic are “mindless sheep”. We’re not capable of independent thought and we follow whatever the Church teaches without thinking it through for ourselves. I’ve personally been called a “mindless sheep” more times than I can count. This pseudo-argument puzzles me. Many of these same people who will vote to reelect the current occupant of the White House because they’re still waiting for “hope and change” think I’m a sheep because I choose to believe the Son of God and the Church He created. I believe that Jesus became one of us, died, and was crucified to save us from our sins. Billions of people share that belief. Are we all mindless sheep? I think even our moth ruthless detractors would give us that one. So, when does one become a sheep? I think a lot of haters believe that agreeing with the Church and disagreeing with them qualifies us for sheepdom. To pro-abortionists, the fact that we believe in the sacredness of ALL human life is sheeplike. Despite the fact that our support of all life comes directly from the before-mentioned Commandments, somehow extending the prohibition against murder to our future citizens puts us into some brainless caste. Here’s the thing. I (and I hope you) believe what the Church teaches. I don’t fall thoughtlessly in line with every word that comes out of the Vatican (or from my local ordinary) but I’m committed to learning everything I can about an issue. When I do, the truth invariable comes down on the side of the Church. How can this be? Maybe it has something to do with Jesus’ statement to Peter and the other Apostles, “whoever hears you, hears me.” Could it be that He wasn’t kidding? Did He really mean it? I believe that He did. Does that make me mindless? I don’t think so. Not anymore mindless than anyone who chooses to put their faith in something outside themselves. I don’t think that anti-Catholics are mindless. I just think they’re wrong. That was the early Church. That was the Church that Jesus envisioned when He gave the keys to the kingdom to Saint Peter, the first Holy Father. There’s no reason to think that He ever wanted that vision of His Church to change. He wants all believers, that means you and me, to be of one heart and mind. Luke tells us that the apostles had great power and that great favor was accorded to them. But even with their great power, our Gospel story, finds the apostles locked in one room, “for fear of the Jews.” Even in the very beginning, the Church the Jesus’ Church suffered from persecution. But the strength of the believers and the power of the Apostles, passed on to their successors, has always allowed the Church to survive. As Jesus said, even the gates of hell would never stop His Church. We know what the Church teaches and we believe in it because we’re all called on to be of one heart and one mind. When the Holy Father speaks the world listens. When the local bishop or archbishop speaks the members of his flock listen. When the US Bishops speak American Catholics listen. Lately the US Bishops together and individually have been speaking out against our government’s attempts to curtail our religious freedom. This week the Bishops issued a statement called “Our First, Most Cherished Liberty—A Statement on Religious Liberty”. It’s fairly long, thirteen pages, but it’s well worth your time to read. Frankly, I don’t think most of us really understand how serious this attack on our religious freedom is. I hope you’ll take the time to read it this document. It begins, “We are Catholics. We are Americans. We are proud to be both, grateful for the gift of faith which is ours as Christian disciples, and grateful for the gift of liberty which is ours as American citizens. To be Catholic and American should mean not having to choose one over the other. Our allegiances are distinct, but they need not be contradictory, and should be complementary.” That’s a key point. It’s perfectly reasonable, in fact it’s guaranteed in our Constitution, that we can be Catholics and Americans at the same time. Some may say that the Bishops are overreacting to this HHS mandate but the document points out that this isn’t the only government attack on our religious freedom. It’s just the latest and most publicized. In our neighboring state of Illinois, also in Boston, San Francisco, and in Washington DC, Catholic Charities have been driven out of the business of providing adoption and foster care services. Why? Because they won’t place children with homosexual couples or cohabitating couples as Church teaching requires. Several states have recently enacted laws that forbid what the government calls “harboring” undocumented immigrants. Don’t misunderstand. Actually harboring law breakers should be a crime. But what these new laws call harboring includes baptizing children of illegal immigrants; hearing their confessions; and anointing the sick. Administering any of the sacraments, counseling them in time of loss, even allowing them to attend Alcoholics Anonymous meetings held on church property are illegal. At the University of California Hastings college of law, the Christian Legal Society has been denied the use of campus facilities because it requires members to be Christian and to abstain from sexual activity outside of marriage. The CLS is the only group ever to have been denied access by the school. This is my personal favorite. Catholic Imigration and Refugee Services have aided thousands of legal immigrants. The federal government has changed its policies to insist that abortion and birth control services must be provided. In a bizarre ruling, a federal court in Massachusetts ruled that the government violates the First Amendment by allowing the Church to follow its religious beliefs. There’s so much in this document that I could talk about it for a long time, but I know you don’t want that. But there are a couple of key points here that I want you to think about and especially to pray about. The Bishops quote Doctor Martin Luther King on the subject of “unjust laws”. A just law is a manmade law that is in line with moral law or the law of God. An unjust law violates natural law. To quote the Bishops, “An unjust law cannot be obeyed. In the face of an unjust law, an accommodation is not to be sought.” They go on to say that Catholics, “in solidarity with our fellow citizens, must have the courage not to obey them.” That’s called “civil disobedience”. It was the foundation of the civil rights movement. Please pay attention to this. The Bishops aren’t telling Catholics that they MAY refuse to follow an unjust law. They’re telling us we MUST refuse. People, this is serious stuff. They’re saying that Catholic institutions have to refuse to follow the HHS mandate. They can stop providing health insurance, or they can continue to provide it, not following the HHS mandate, and pay the consequences. Or, they can close their doors. They’re telling us that we must speak out and do whatever we must to end religious persecution. They’re telling Catholic clergy that we must do all we can to lead you in defending not just our faith, but people of all faiths whose freedom is being trampled. Trust me, you’re going to be hearing much more about it in the coming weeks and months. There’s a lot at stake here. If we lose this fight, the door is open to unrestricted government interference with our religious freedoms. You and I must remember what Saint Luke wrote in today’s 1st reading. What happened next? Many of those who heard Him speak walked away from Him. This was too hard for them to understand; too hard to accept. Even today, knowing what happened on Holy Thursday, many non-Catholic Christians believe that Jesus was speaking figuratively. The same people whose faith teaches that everything in the Bible must be taken literally refuse to accept the Real Presence of Jesus Body and Blood in the Eucharist. But, look at the context. Jesus had been sent by His Heavenly Father to establish a Church. Beginning with just twelve Apostles He was gaining a following. By His words and by His actions, He was gaining new followers every day. Then He tells them they must eat His flesh and drink His blood and He begins to lose them. They’re walking away. If He’d been speaking figuratively wouldn’t it have made sense for Him to say, “Wait! I didn’t mean you really have to eat my flesh and drink my blood. It was just a metaphor; a figure of speech.”? Read on. He stands by what He’s said and then asks the twelve if they want to leave Him too. Of course, they say “no”. Even though the Apostles have faith in Jesus they still must have wondered exactly what He meant by drinking His Blood and eating His flesh. It had to be the subject of a lot of conversation around the campfire when Jesus wasn’t there. As a deacon, I prepare the altar for the priest and stand by his side as he turns ordinary bread and wine into Christ’s Body and Blood. I can say, without fear of contradiction, that the elements of the Eucharist look exactly the same after consecration as they did before. They also taste the same. Yet you and I know that they’re different. How do we know? Because we have faith. Our understanding of Christ’s life, death, and resurrection tells us that Jesus was incapable of telling a lie. If we don’t believe everything He said, then we can’t believe anything He said. If we catch Him in even one lie, then our faith is destroyed. When we receive the Body and Blood of Christ, we take him into our very selves. It’s great to read the Bible, to go to mass, to pray privately, and to do any number of other things that bring us closer to Christ. 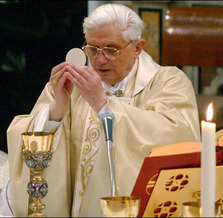 But when we receive the Eucharist we aren’t just close to Christ, Christ is within our very bodies. No one can come closer to God than that. Frankly, I can’t imagine why anyone would even consider leaving the Catholic Church and giving up such an amazing gift. Having Christ’s actual presence circulating in our own bodies is beyond cool. It’s so awesome that it’s almost indescribable. If priests are cool then bishops must be cooler. Right? Again, this is not a scholarly dissertation on these men who are directly descended from the twelve Apostles. There are plenty of places to find that kind of material. This is about why bishops are cool and we’re lucky to have them. However, I am going to throw one big word at you: subsidiarity. It means that the Church has determined that the best place to make decisions is as close to the people as possible. The really big stuff, the stuff that affects all Catholics all over the world, is decided in Rome. The things that affect the local diocese are decided by our bishops. Remember, we have a Code of Canon Law that directs everything that goes on in the Church, but there’s still plenty of wiggle room for the local ordinary (the bishop) to put his personal touch on his diocese. More important, part of the bishop’s responsibility is to deal with the secular world on our behalf. The current kerfuffle about the government’s birth control mandate is a good example. The Pope could jump into the middle of this issue, and at some point he may. But for now, the United States bishops are at the forefront, both as a group and individually. The vast majority of our bishops have written pastoral letters to their flock urging us to oppose this violation of our Constitution. For most young Catholics, it’s quite a thrill at confirmation time when they get to meet the bishop, either at their own parish or at the Cathedral. While the bishop is a local cleric, most of us associate him with the universal Church. He’s our direct line to the Vatican. While we most often see our bishop performing on the big stage with all the pomp and pageantry that the office deserves, most of them are very down-go-earth guys who would rather sit down with you one-on-one and have a cup of coffee. Unfortunately for us, they’re so busy that they don’t get to do that very often. I don’t think I can finish a post on bishops without mentioning the president of the United States bishops, Timothy Cardinal Dolan. 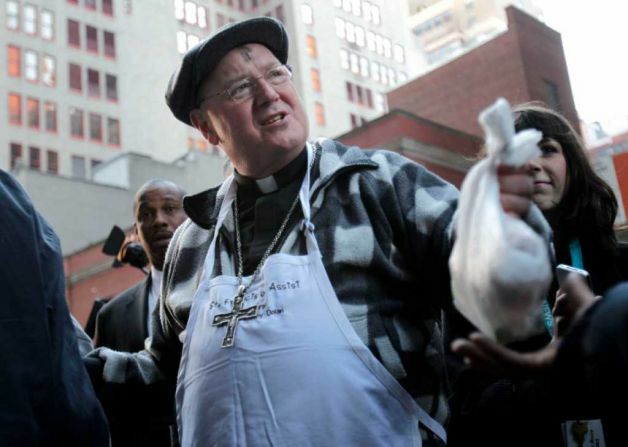 Cardinal Dolan distributes food to the poor in New York City. This Health and Human Services fiasco has brought His Eminence into the national spotlight and we should all be glad it has. I could be wrong, but I’ve always pictured Jesus as man very much like Cardinal Dolan. I believe Jesus had a sense of humor (otherwise I wouldn’t be a deacon), I believe He was friendly and outgoing, and I believe that when it was necessary, He was tough as a bulldog. (Remember the moneychangers?) Isn’t that how we’d like all our bishops (and priests and deacons) to be? Face it, most of us are lost sheep and we need a shepherd. Our parish priests fill that role most of the time, but they do it on behalf of the bishop. When you go to mass this weekend and the priest prays for our Benedict our Pope, and for our bishop and for all the bishops, say a quiet prayer of thanks for your local shepherd. As I said yesterday concerning priests, our bishops have been under attack in recent years. Did some of them mess up? Clearly they did. Did they do it out of malice, or a desire to break the law? No, I don’t think so. Remember on the very night that Jesus created the presbytery one of His bishops sold him out for a few pieces and another, the one who would become the first Pope, denied that he knew Him, not once but three times. Bishops are human, just like you and me. They’re subject to the same faults and failings as we all are. I don’t know about you, but I wouldn’t have it any other way. 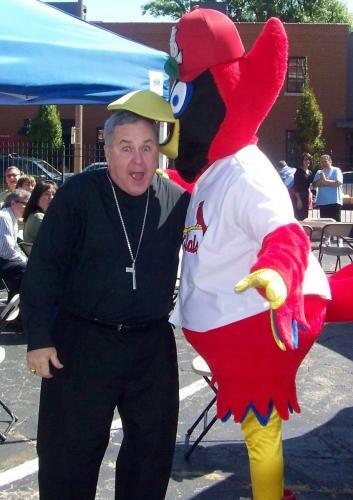 My archbishop, Robert Carlson, and your bishop, whoever he may be, is way cool!